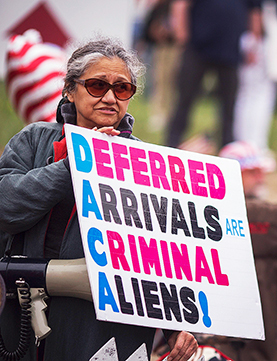 Will “Dreamers” be protected from deportaion? Immigration policy continues to be a flashpoint in U.S. politics. The fate of the “Dreamers,” young people brought into the United States illegally by their parents, is up in the air, with their future clouded by ongoing court battles and a last-ditch effort in Congress to grant them permanent residency. President Trump has been unable to secure funding for a wall along the U.S.-Mexico border that he has called essential to securing the nation’s borders. Federal immigration agents under Trump have taken a more aggressive stance than under the previous administration in removing people living illegally in the United States, but so-called sanctuary cities are resisting cooperating with those efforts. In the latest chapter in a battle taking place in Congress and the courts, 20 congressional Republicans broke with their party leadership in mid-May by backing a move to force a vote on legislation that would protect Dreamers from deportation. 2 The lawmakers, who represent districts that strongly back the Dreamers, support a discharge petition — a parliamentary maneuver that can bring bills to a vote over the objection of the House speaker, who controls the chamber’s agenda. Do they help spur growth?